It's officially been a month since the Philadelphia Eagles won Super Bowl LII and the team is already looking ahead to the 2018-19 season, with some difficult roster decisions looming over the next few weeks. 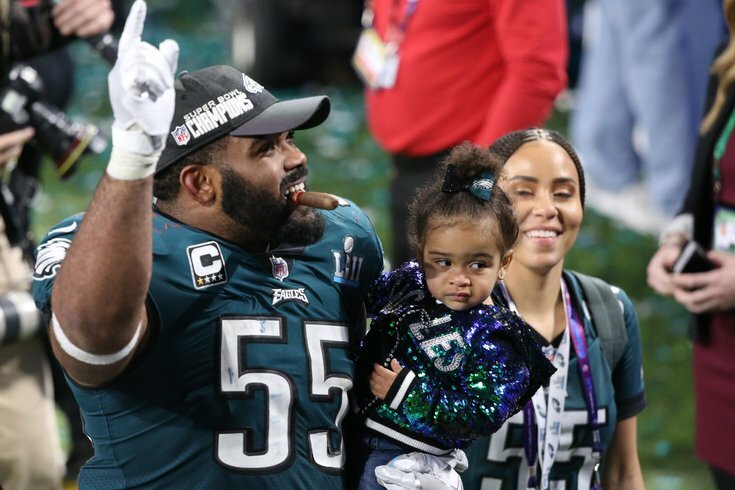 One of the Eagles' marquee free agent is defensive end Brandon Graham, whose heroic strip sack of Tom Brady in the final minutes of the Super Bowl helped clinch Philadelphia's historic victory. Graham, 29, appeared this weekend on NFL Network's "Good Morning Football," joined by New England Patriots wide receiver and New Jersey native Chris Hogan. The two were in the studio to discuss their participation in the 2018 Business Bootcamp, an event that provides NFL players an opportunity to explore professional pathways after their football careers have ended. But that was only one of the topics discussed during the broadcast. Eagles fans will remember that after the team's win over the Atlanta Falcons in the NFC Divisional round, a fired up Graham had a few choice words for a certain NFL Network employee. He twice attacked "Good Morning Football" host Peter Schrager, calling him "wrong" for his naysaying about the underdog Eagles. The only problem was that Graham targeted the wrong reporter. He meant to take aim at co-host Kyle Brandt, whose pre-game tirade — it was more of a sarcastic act than an opinion — claimed the Eagles couldn't beat the Falcons. Brandt playfully confronted Graham about the mix-up this weekend, poking fun at him for saying "Preeter" Schrager and for singling out the wrong guy. Then, just for good measure, the "Good Morning Football" crew brought Schrager on from the NFL Combine in Indianapolis. It looks like Graham made a new friend.